Actually, more of a scorpion. 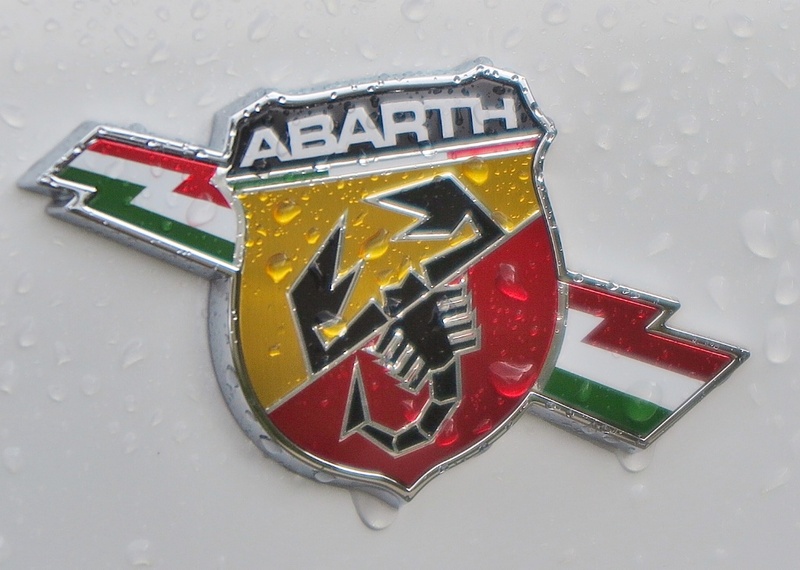 It’s been the Abarth logo since Carlo Abarth bought up all the unfinished Cisitalia sports cars in 1947 and formed Abarth & Co S.p.A in Bologna. Carlo was born under the sign of Scorpio. Carlo had been Cisitalia’s sporting director, and when he saw the company was going under, he grabbed whatever hardware he could and built up a successful racing team. In 1952 he formed a loose association with FIAT S.p.A. to develop some of their production cars for road racing and hillclimbing. Probably the one that scored the most attention was the tiny Abarth FIAT 595 (right), a development of the Cinquecento, with a 1.0L twin cam engine. It was a little rocket, and I remember test driving an Australian version (just like this US racer) for a MODERN MOTOR magazine feature at Oran Park Raceway in Sydney in 1976. In 1971 FIAT acquired all of Carlo Abarth’s little company, which by then was specializing in tuning kits, and highly-efficient exhaust manifolds, mainly for Fiats. Since then FIAT has adorned various premium sports models with the Abarth scorpion badge. 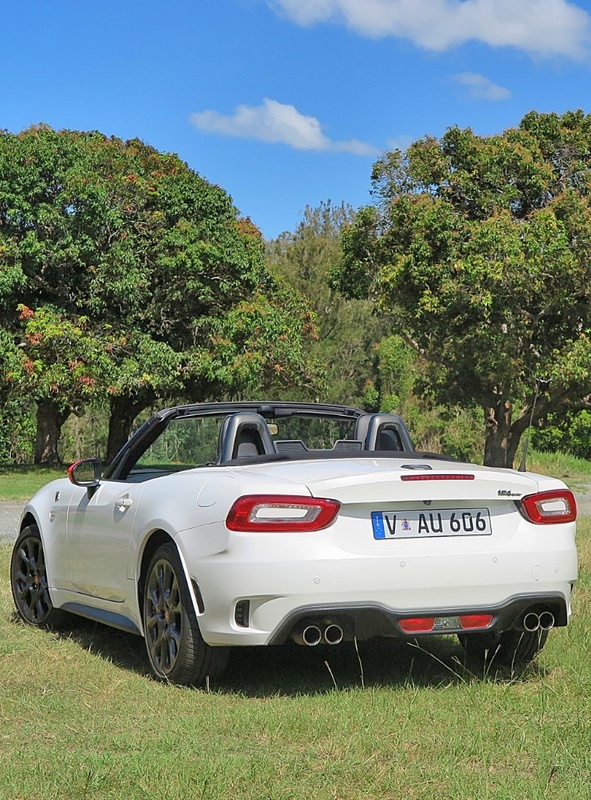 Now, in 2016 we get the FIAT version of the Mazda MX5, with an Abarth badge, and quite a few modifications to the Japanese-sourced roadster, to rev up FIAT’s image Down Under. The Fiat 124 Abarth Spider is wholly assembled at Mazda’s Hiroshima factory in Japan. 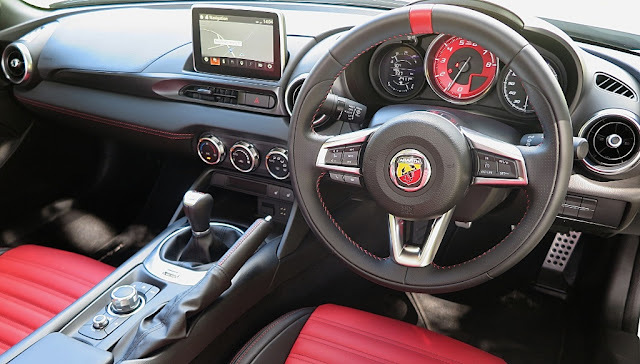 FIAT ships over the 1.4L Multi-Air engine, the six speed manual, some suspension bits including Bilstein shock absorbers and an Abarth exhaust system. The exterior panels are designed by FIAT Centro Stile to fit on the Mazda subframe and body assembly, and the interior is trimmed with leather Abarth seats and lots of red highlights, like stitching, seats, tacho and rear view mirror caps. Okay, so it’s a joint venture aimed at soaking up extra Mazda production volume, and giving FIAT a sports car ‘on the cheap’ and something to shout about, and also to give its poor, beleaguered dealers around the world a truly 'new' car to sell that has some soul and personality. Plus it will generate showroom traffic! I’ve said before, I think this is a good deal, for both companies. It’s a pragmatic solution for all stakeholders, to the problem of justifying sports car volume in a world turning away from passenger cars to SUVs, and the onslaught of a slew of electric cars, which offer about as much driving excitement as squeezing out a wet sponge! 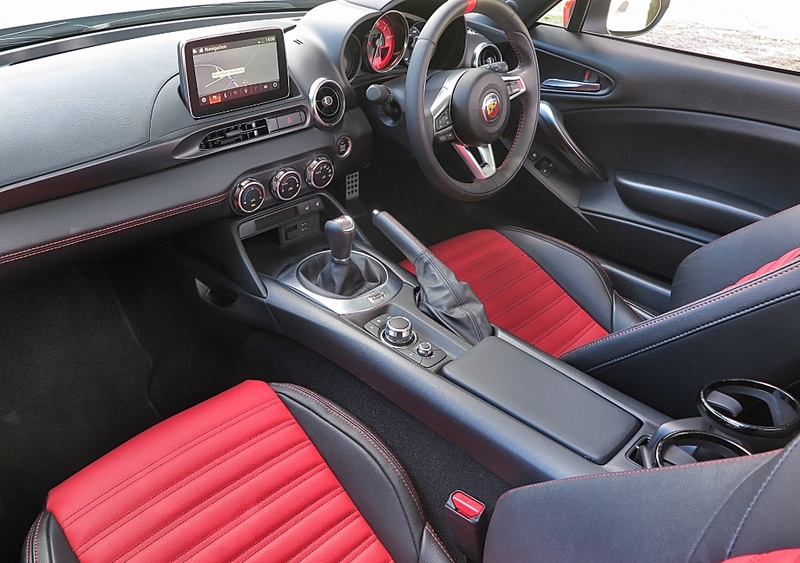 When you fire up the Abarth-branded FIAT 1.4L turbocharged engine the Abarth exhaust system tells you it’s raring to go. This engine produces about 125kW (170hp), and mated to the Italian six speed manual transmission it’s a ball to drive. Actually, there is one design aspect of both the MX5 and the Abarth 124 which is a pain, and it's the placement of the handbrake. If you're driving either of these cars in Italy or the USA, no problem. But, in RHD markets, the handbrake bobs up right in the middle of the plane of movement where your hand slides across to change gear. It takes a lot of getting used to. 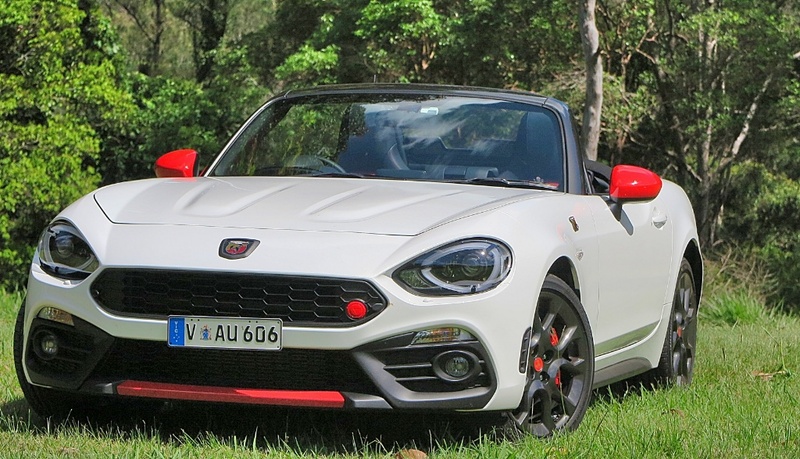 This car starts at AUD$41,000 and the worthwhile extras (Abarth seats AUD$490; and Metallic Paint AUD$490), mean it tops out at AUD$42,000. The test car came with a 'visibility pack', which was mostly lights, bells and whistles priced at AUD$2500 – which I could happily leave in the showroom. This compares to the base Mazda MX5 roadster, with six-speed manual, which starts at AUD$36,000, plus the Connect pack at AUD$600 (a must). 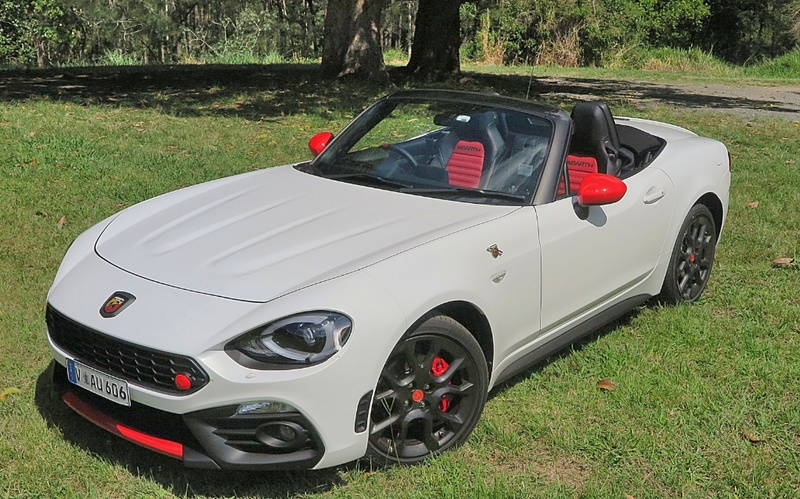 So there’s almost a AUD$6K premium for a European-flavoured take on Japan’s most famous and successful sports car, but the 124 does include Brembo brakes; Bilsteins; Alloys; great tyres and a rear view camera (not available on the base MX5). Hey, if you like European flair. Go for it. The drive will be fun too, I promise you that. The Fiat’s tacho is redlined at 6500rpm, but performance tails off before then, and the traction-control is a pain in the backside, so I turned it off. However, the little 124 Spider is truly fun to drive. It’s not the outright acceleration that stirs you, it’s the responsive handling. 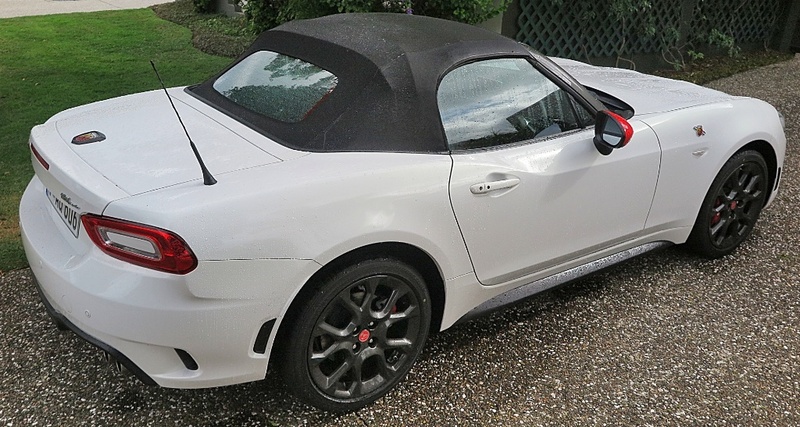 The Fiat 124 Abarth Spider has an extra stiffening strut joining the front suspension towers to the body frame, and this gives the open sports car a lot of extra rigidity, and has almost the same effect as if you seam-welded the body together. On the road the 124 is stiff, well-grounded, and truly fun to throw around. You can tease the tail out and the handling is super responsive – providing you’ve turned off the traction-control. I would have to describe the whole driving experience in the 124 as 'raw'. Really, at times it feels very much like my cousin's MG TC. The ride is pretty lumpy, compared to its Mazda stablemate, and on some surfaces that results in a lot of fore’n’aft pitching, but on the right road, the upside is the 124 Spider offers great control. 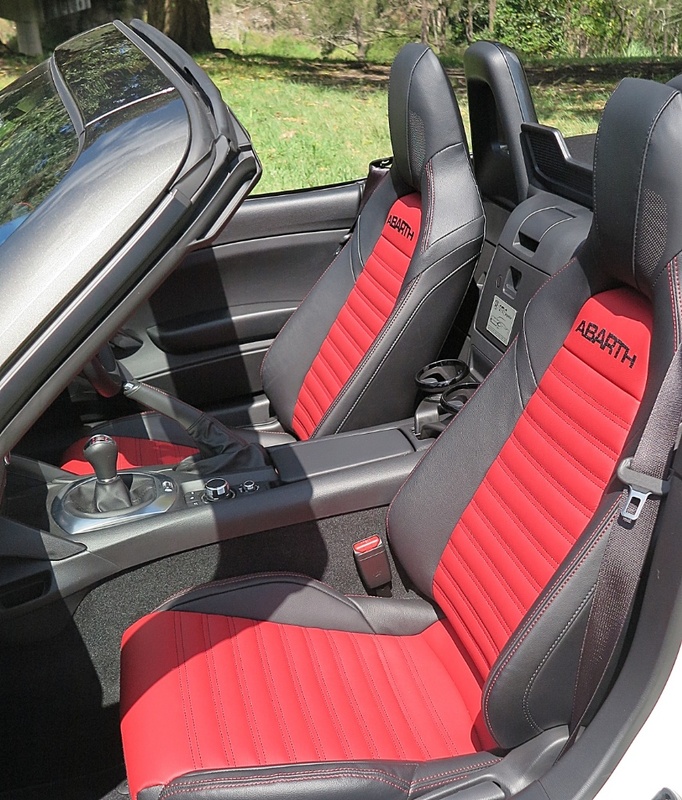 I’m not sure if the red Abarth seats have anything special in their construction, apart from the name embossed in the leather, but they hold you well in a tight corner. Another, slight, downside is that apart from the trunk, and a tiny centre console bin, there’s NO storage – nothing, zippo, zero. 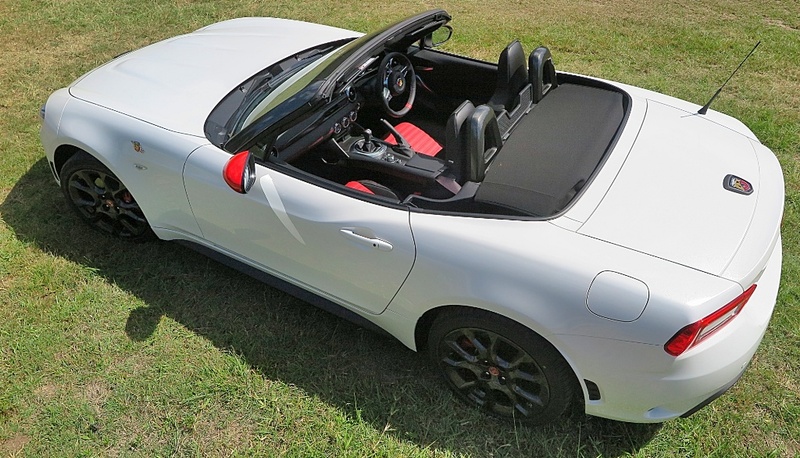 Hey, you’re driving an Italian-tickled Mazda MX5, and I liked the experience. This little car was a lot of fun, with a lot of creature comforts, and enough badge envy to garner a lot of thumbs ups on the highway as I sped past the slow burners. Is it worth the premium over the Japanese version? Of course it is, if you want something different, and something to talk about over double espressos at the beachside café on Saturday morning. Then on Sunday, you get to go out and enjoy yourself, and that provides more conversation for next Saturday. It’s the gift that keeps on giving. This is a REAL sports car; this is a ‘Fun Spider’ – enjoy!